NBC News suspended 'Nightly News' anchor and managing editor Brian Williams for six months without pay on Tuesday night. NBC has suspended Nightly News anchor and managing editor Brian Williams for six months without pay, according to numerous reports. Lester Holt will continue to host the network’s flagship news program in his absence. The star newsman’s credibility had sunk in the past week after revelations that he misstated his experiences during the Iraq War on-air and in other venues. Williams’ reporting from New Orleans during Hurricane Katrina drew further scrutiny on Tuesday after a former hotel owner in the city disputed his reports of a body floating by him in the French Quarter and that he got dysentery while covering the storm. Meanwhile, the Drudge Report claimed Tuesday that Savannah Guthrie is the NBC Nightly News anchor "in waiting," but not all media reporters were convinced. Drudge says @SavannahGuthrie is "top replacement option" at NBC: http://t.co/KZhVtpFfHx FWIW, I don't think so. Research from The Marketing Arm found that consumers’ trust in Williams has dropped significantly in the past week. Before "coptergate," the NBC Nightly News anchor was the 23rd most trusted person in America. Now, he’s ranked number 835. Stars and Stripes also released the audio from its interview last Wednesday with Williams, in which he says he may have misstated what happened during the 2003 US invasion of Iraq because he was scared. Rasmussen polling found that 40% of respondents believe the NBC News frontman should lose his job over the scandal, while 35% think he should not. A second story told by Williams about riding in a helicopter in a war zone is facing scrutiny. The NBC Nightly News anchor has given different accounts, with varying proximity to events on the ground, about witnessing rocket fire in northern Israel during a conflict with Hezbollah in 2006, according to The Washington Post. Brian Williams is backing out of an appearance on the Late Show with David Letterman scheduled for Thursday, according to the Associated Press, just one day after announcing he will recuse himself from anchoring the NBC Nightly News for several days. Williams is taking himself off the air for several days, the anchor said Saturday in a personal note posted on NBC News’ press page. Lester Holt will fill in. "In the midst of a career spent covering and consuming news, it has become painfully apparent to me that I am presently too much a part of the news, due to my actions," Williams said in the statement. With NBC News investigating its star anchor, Variety speculated about who could replace him if the axe falls. The bold-face names floated were Savannah Guthrie, Holt, Matt Lauer, Katie Couric, and — one surprise — MSNBC and Telemundo host Jose Diaz-Balert. Williams also got star treatment on the New York Post’s Saturday cover. 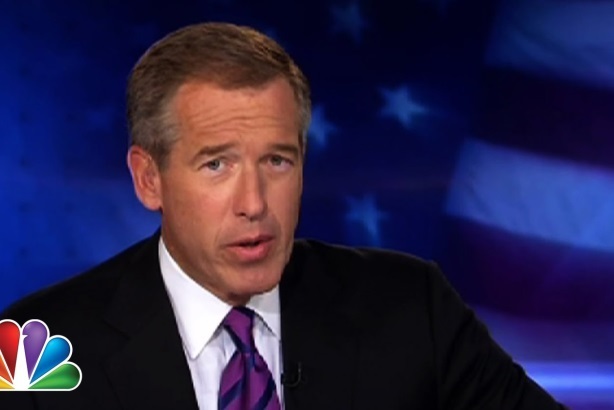 NBC News launched an investigation into Williams’ statements, now retracted, about riding in a helicopter that was shot down in 2003 during the US-led invasion of Iraq. Former New York Daily News editor Richard Esposito, who leads NBC News’ investigative team, is leading the inquiry. Williams’ reports from New Orleans during Hurricane Katrina, specifically that he saw a body float by, also received scrutiny from local media. Williams’ on-air apology issued on Wednesday night begat further criticism, with one Iraq War veteran saying the helicopter the anchor was in never came under fire. Fox News analyst Howard Kurtz said the mea culpa raised questions about other stories Williams had reported on. The New York Post reported that predecessor Tom Brokaw wants Williams fired. Williams apologized during the Nightly News broadcast and in a Stars and Stripes interview, saying he was not aboard a helicopter hit and brought down by an RPG during the 2003 Iraq invasion. He had repeated that claim numerous times over the past decade, as recently as last Friday.